Following the announcement of Street Fighter 2010 : The Final Fight and Nobunaga's Ambition, Nintendo has confirmed another trio of oddball classics that will be hitting its Virtual Console services on the Wii U and Nintendo 3DS. 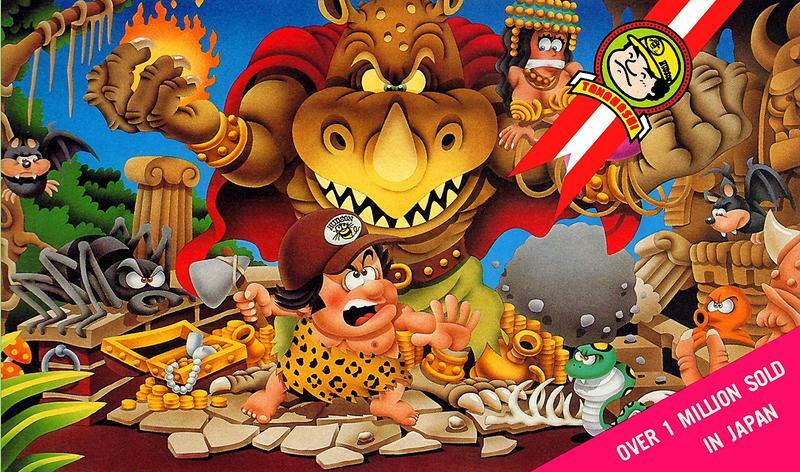 Adventure Island is a classic and brutally difficult platformer starring Master Higgins. Our vacationing protagonist loses his girlfriend while on vacation in the South Pacific, and he must skateboard his way through 32 gut wrenching stages if he wants her back. This classic is a spin-off of the SEGA arcade series Wonder Boy, and Master Higgins, changed from Master Takahashi in Japan, was an actual executive at Hudson Entertainment who could push an NES button 16 times in a single second, believed to be faster than anybody. Takahashi Meijin became a sort of superstar in the 80s Japan, and the Adventure Island series would continue for four games on the NES and Famicom. This first game will be released on Sept. 11, and hopefully the other games will follow. Joining Adventure Island are Wild Guns, an excellent and overlooked third person shooter for the Super Nintendo, and Legend of the River King 2, a Game Boy Color fishing simulator from the cult-classic series. Both games are from Natsume, and while I've never had a chance to go hands on with the Legend of the River King series, I can't praise Wild Guns enough. Watch the clip for a decent idea on what to expect. It's especially great to see this game since the physical cart is just so darn expensive these days on the secondhand market. Both Natsume games will be released on Sept. 18, Wild Guns for the Wii U and Legend of the River King 2 for the Nintendo 3DS. Busy month for underrated games on the Virtual Console. I'm tempted to pick up all five. Any of them on your radar?